Merge or Join multiple PST files with exclusive Kernel Merge PST. 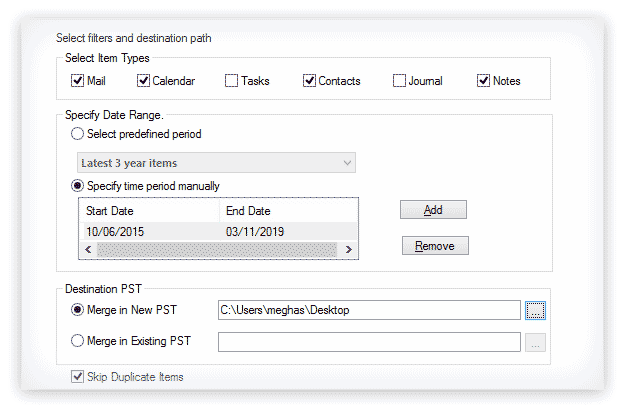 Merge all item of PST including contacts, tasks, calendar, etc. The PST Merging tool from Kernel can smoothly merge two or more PST files into one single PST file without any data loss or interruption. Kernel Merge PST gives you two options to merge PST files. With the “Merge” option, you can merge data into a single PST file, whereas with the “Join” option, you can merge data in a single PST file while keeping separate folders. This tool gives you the freedom to merge only selected folders of PST files. Just uncheck the folders that you do want to merge with another PST. 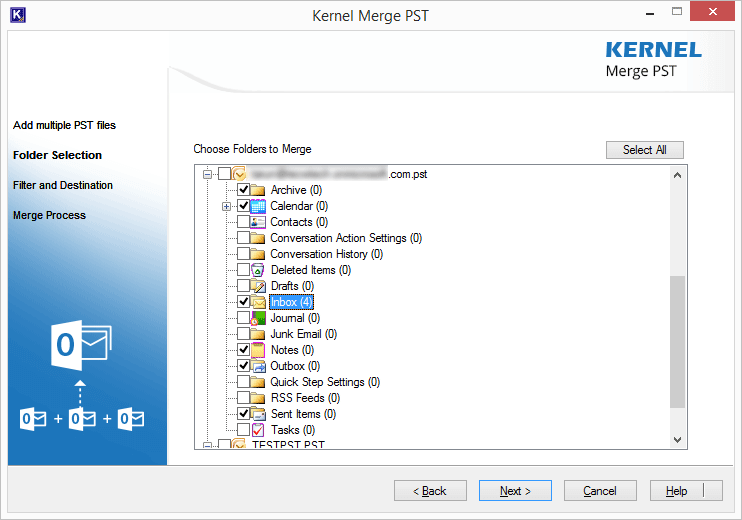 With Kernel Merge PST, you can merge every item of a PST file, including emails, contacts, calendar, tasks, etc. With advanced filters of Kernel Merge PST, you can merge specific items of a PST file, such as Emails, Tasks, Calendar, Contacts, etc. Also, you can merge data between a particular period. This software support PST file of every MS Outlook version, including Outlook 2016, 2013, 2010, etc. The tool offers two saving options to merge or join multiple Outlook PST files. One option is to move the merged files to the new created PST file. And the other option is to save the merged PSTs to an already existing PST on your system. 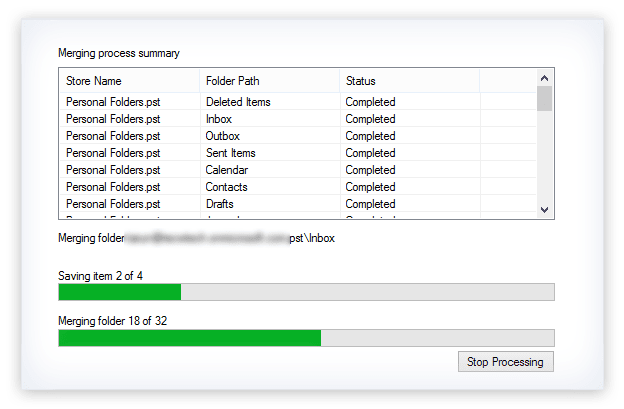 This tool allows users to skip duplicate items in PST files, which means if you have same emails/items in the PST files, then it will not merge them into the new PST file. 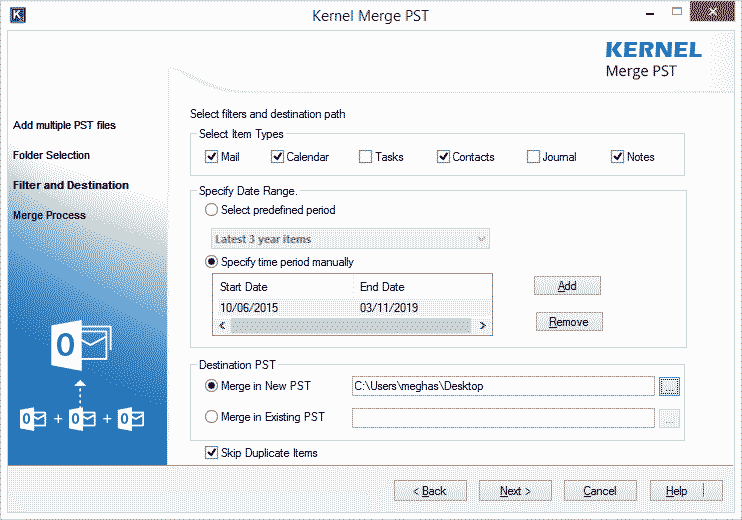 With Kernel Merge PST, you can set a specific date range for items before merging your PST files. It means if you want to merge items between the time period March 2015 to Dec 2017, then it can easily be done with the Kernel Merge PST tool. This software is highly compatible with all version of Windows operating system, including Windows 10/8.1/8/7/XP/Vista/2000, etc. PST is the short form of Personal Storage Table, which is an MS Outlook file format that stores a user’s data for POP3, IMAP, and web-based email accounts. All versions of MS Outlook use PST files. However, in earlier versions (Outlook 2000 and 2002), the PST file was stored in ANSI format with a file size limit of 2GB. In later versions, it is stored in UNICODE format with maximum file size of 20GB or 50GB. What Needs Does PST Merger Tool Fulfill? 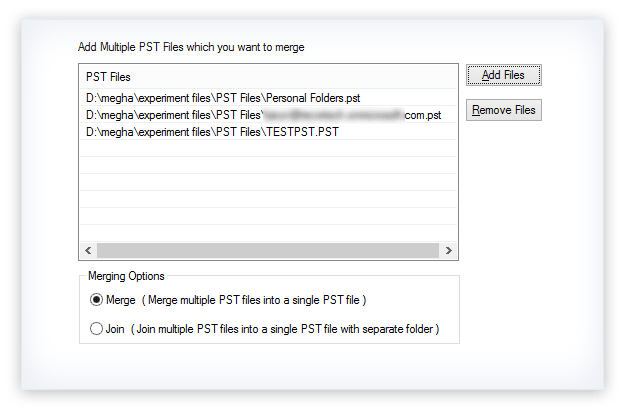 Merge two or multiple PST files into one. Select Select PST files to add to the software. Filter Apply filters to merge specific PST files data. Merge Merging process of the Kernel Merge PST. 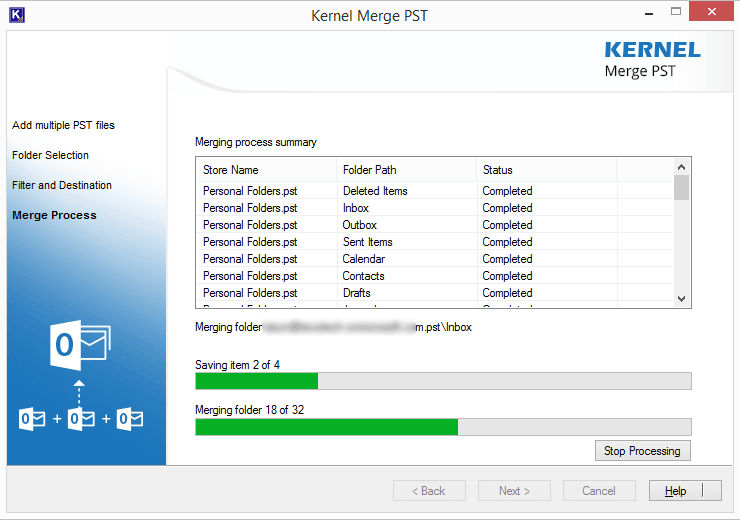 How to merge PST files using Kernel Merge PST tool? Follow the below steps to merge multiple PST files. Launch Kernel Merge PST tool on your system. Add the PST files that you want to merge. Select the folders to merge. Apply the required filters on the PST files. Select a location on your system where you want to save the merged file. Click “Next” to start the merge process. Does the tool allow to merge multiple PST files to the one I am already using? Yes. The tool includes an option Merge in Existing PST selecting which you can merge the selected PSTs to your existing PST file. There is another option Merge in New PST using which you can merge or join the data from PST file to a new PST file. Can this tool merge PST files data keeping their folders separate? Yes, using the “Join” option of the tool, you can easily merge PST file data keeping the folders separate. Is this tool capable of merging Deleted items of PST files? Yes, Kernel Merge PST is capable of merging deleted items as well as junk items of PST files. Is it possible to merge specific folders or items of PST files with this tool? Yes, this tool gives you the freedom to select specific folders and items before merging the PST files. Where can I save the merged PST file? You can specify any location on your system to save the merged PST file. Does the tool allow to export PST files to Gmail or Office 365? No, the tool doesn’t allow to export PST files to any other platform. Can I run this tool on Mac OS? No, this tool is compatible with Windows operating system only. You cannot run it on any other operating system. How to activate the technician license of Kernel Merge PST tool? First, you’ll have to purchase the technician version of the tool. You’ll receive the activation key via email. Now, download the technician version from the shared link. After installing the tool, enter the provided key to activate the technician version. Kernel Merge PST allows you to merge multiple PST files without any hassle, whether it’s ANSI PST or Unicode PST file. Can I merge large-sized PST files with this tool? Yes, you can easily merge large-sized PST files with the tool. It supports PST file of every size. How can I merge specific folders with Kernel Merge PST? After adding the PST files, the tool will show all the folders of a PST file. Select the specific folders that you want to merge. Is it possible to merge PST files with a specific period of time? Yes, with advanced date filters of Kernel Merge PST, you can easily merge data based on the date. Can I merge whole data of PST files with the trial version of the tool? No, the trial version allows you to merge 20 items per folder. 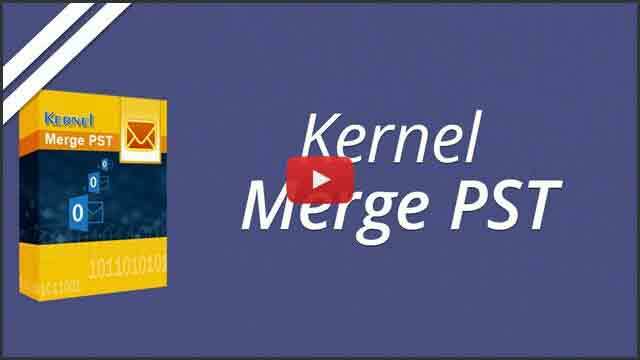 If you want to merge the whole data, then purchase the full version of Kernel Merge PST. "Keep up the good work! Your customer support team is in one word awesome!" Nice tool! Now I don't have to worry about my data as it is in safe hands. 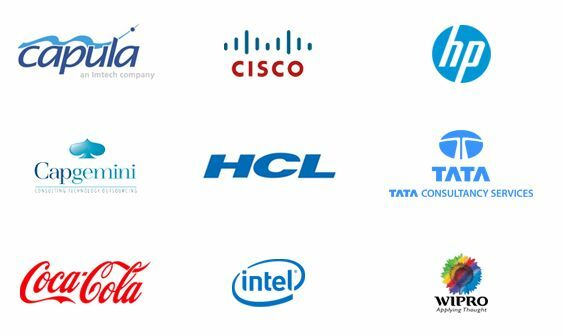 "Not only the design but the fantastic features like migrating selective data of the tool surprised me. It saved me time as well as space." Welcome screen of the Kernel Merge PST. Adding PST files to the software. Selecting specific folders of the PST files before merging. Advanced filtering options to merge PST files. Merging process of the Kernel Merge PST. Notification window after the merging process is complete. 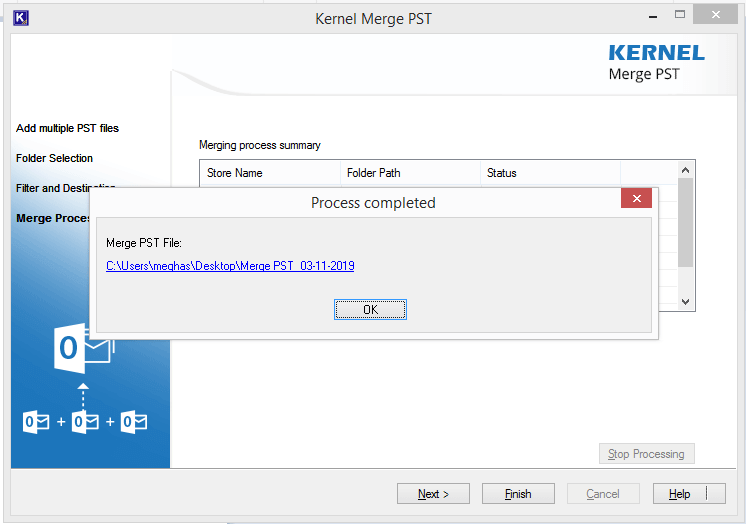 The updated version of Kernel Merge PST tool, version 19.3 has been released. It includes some new features and algorithms to carry out merging of multiple PST files more swiftly. It now offers to merge multiple PST files to the existing PST file on your system. Also, you can join multiple PST files and save it to the existing Outlook PST file.